The renewed interest in Gothic architecture was part of a romantic movement that began in England in the late 18th century and reached its pinnacle in America during the middle decades of the 19th century. Writers of early Gothic novels such as Horace Walpole (The Castle of Otranto, 1764), Jane Austen (Northanger Abbey, 1798), and Sir Walter Scott (Ivanhoe, 1819) captured the popular imagination and helped inspire a fascination with the pageantry of the Medieval world. Looking to the Gothic churches of Medieval Europe as models, Gothic Revival buildings represented a departure from the rigid symmetry of classically influenced architectural styles of earlier eras. These ornate and picturesque buildings were defined by their asymmetry, irregular rooflines, ornamental details, and bay windows that allowed the occupants to take in views of the gardens. Generous porches that flowed into the landscape suggested a harmony with nature and were considered essential. Architects Richard Upjohn, Andrew Jackson Davis and Andrew Jackson Downing were promoters of the Gothic Revival in America, appealing to a genteel and cultured vision of the American home in a rural setting. Downing, collaborating with Davis, published Cottage Residences in 1842, one of the first American pattern books promoting Gothic Revival cottages; Upjohn published Rural Architecture (1852). In Newport, Davis worked on the main house and gardens of Malbone (1849-1850); Upjohn designed Kingscote (1839-1841), a picturesque Gothic Revival style “cottage orné” (ornamental cottage), and one of the first summer cottages built in Newport. 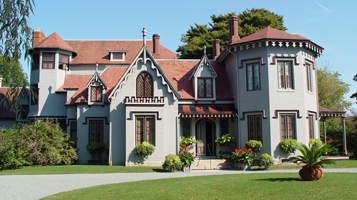 Kingscote has many of the characteristics of the Gothic Revival style. The central bay features a pointed Gothic arch window with scrolled verge boards, also called “gingerbread,” under the eaves of the roof. A finial projects from the peak of the gable. The crenellations atop the first-floor window were inspired by the openings in castle walls and towers of the Middle Ages. The entrance porch roof is painted in striped colors and has a wooden border of pendants, meant to recall the tents of medieval jousting tournaments. 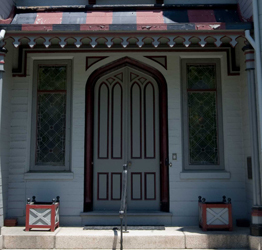 The front door repeats the Gothic arch theme. The diamond-paned casement windows are of late medieval inspiration. A label mold, sometimes known as a hood or drip mold, surrounds the top of the window. Decorative pendants adorn the gable. The porch was an essential element of Gothic Revival architecture that bridged the gap between the indoors and outdoors, uniting the inhabitants with nature. 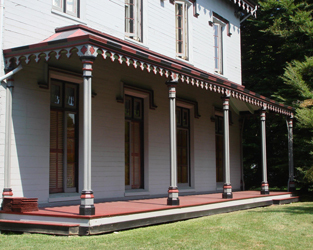 The porch roof is supported by Gothic “colonettes,” slender columns grouped together to form a single support.